The political reality ushered in by the 2016 election poses the greatest threat to our fundamental rights and protections that we have faced in our lifetimes. Opponents of labor unions and worker rights now control all three branches of the federal government. There are now “25 ‘triple-red” states, in which Republicans control the governor’s mansion and both houses of the legislature. Another eight states have Republican governors. The challenges for CWA and the entire labor movement are unprecedented. Workers and union members will be affected by a broad range of policy changes including the possibility of national “right-to-work for less” legislation and the certainty of a hostile National Labor Relations Board, National Mediation Board and Department of Labor. State right-to-work battles and paycheck “deception” fights are underway, with “right-to-work” enacted recently in Missouri and Kentucky all with the goal of destroying unions and collective bargaining. States also are looking to silence workers’ participation and voice in the political process by denying public workers the ability to voluntarily contribute to a union’s political action fund. There are at least 26 court cases that attack collective bargaining rights, making their way to the Supreme Court. Some of these cases, such as Janus v. AFSCME Council 31, directly raise the question of whether agency fees are constitutional in the public sector. This decision could eliminate agency fees from the public sector and could cost the nation’s largest public sector unions 30 percent of their resources; for CWA we project a potential loss in the first year of nearly 10 percent of the national union’s expenditures. We should expect this anti-union environment to embolden our employers. Corporations and the U.S. Chamber of Commerce, which has spent decades mapping an attack on workers’ rights, now see new opportunities to extinguish the voice of working people. President Trump figured out how to appeal to many working people who have been devastated by a onesided 40 year class war, and who are disillusioned by the failure of both political parties to articulate a forthright pro worker agenda. This complicates our internal education and mobilization, and highlights the need for new strategies toward the political system. All of this, added to the challenges we were already facing in our industries, sectors and economy should be sufficient to convince us of the need to respond quickly and with urgency. This unprecedented attack on workers and our union requires an unprecedented response. 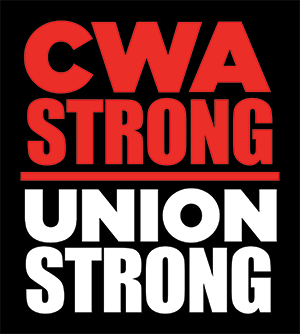 CWA STRONG is an integrated, coordinated plan, implemented across the union and its programs. Never before has CWA launched such a far reaching campaign to engage members, sign up nonmembers, strengthen bargaining, defeat anti-worker legislation and fight back and resist efforts to destroy our union. CWA’s long standing commitment to member engagement and mobilization as well as to building powerful, diverse social movements, provides a solid foundation. CWA STRONG is a bold plan to reach every member, strengthen the union at all levels and increase our capacity to fight back. In order for “CWA STRONG” to be successful, we must change our day-to-day priorities and join together in this coordinated response to the crisis. This will not be easy. Even in times of crisis, large organizations like CWA are prone to inertia rather than innovation. Meeting this challenge will require a level of internal communication, training and mobilization unprecedented in our history. We need a honest and deep understanding of what our members and non-members are thinking, which will involve extensive polling and discussion. We will need meetings at all local, state and District and Sector levels. We will need staff and local leaders to change the way we function. We will need bold new programs in the areas of collective bargaining, organizing, both internal and external, legislation and politics. We will need to reallocate resources within the organization, and we will need unprecedented leadership from the Executive Board, staff and local officers. We need to remind ourselves constantly that generations ago, workers made far greater sacrifices than we are asking here to build the modern labor movement. They left us a legacy of workers power, democracy in the workplace, and a fairer distribution of wealth that now is threatened. We are fighting for the future of our families, for the future of the working class, for the soul of America. This is our moment of challenge. All of us need to rise to the occasion. Create a shared understanding across the union of the scope of the crisis and urgency at all levels of the union to respond. Keep member communication and engagement at the center of everything we do. Provide the resources necessary to continue to bargain the best possible contracts. Make internal organizing a priority activity for locals and staff and decrease the number of non-members. Change our day-to-day priorities at all levels of the union with the objective of spending more time on CWA STRONG activities. Integrate all CWA program work at all levels so our union not only survives but increases our capacity to improve and protect the living standards and working conditions of members and their families. All CWA work will support and contribute to our CWA STRONG goals with a special emphasis on internal organizing and member engagement. We need a unified and engaged membership if we are to have the power to defeat anti-worker legislation and accomplish gains in our contracts. CWA members in every sector have faced determined efforts by management to cut worker health benefits, undermine worker safety and health protections, and contract out our work to low-wage vendors, both domestic and foreign. Our mobilization and strike at Verizon in 2016 woke up the labor movement and became a symbol for workers across the country of the power of collective, strategic action. Our mobilization showed that workers can win in the face of corporate power and greed if they are united. While every set of negotiations is unique in many aspects, bargaining units in every sector must adopt core strategies to keep the union CWA STRONG and obtain the best possible results. Every set of negotiations must begin with an assessment of our strength in the bargaining unit and a plan to address identified weaknesses. Successful internal organizing and member contact is the first step to getting a good contract. Our employers pay attention to every set of our contract negotiations and they are determined to pull down our settlement packages to the lowest level possible. To counteract their efforts, we must coordinate as we have never before, share information and strategies, implement plans that build upon each other’s successes, and mobilize for our own and each other’s fights. As part of the CWA STRONG plan, we will expand on our Collective Bargaining Initiative – a series of webinars on key issues in negotiations as a way of keeping staff on top of issues and best practices. This sort of information exchange will be a regular part of all of our CWA STRONG bargaining preparations. CWA STRONG will aid in coordinating the variety of negotiations in any given year, a strategic coordinating team will be created to assure that the union’s resources are used to their best advantage. The coordinating team will identify common themes, develop leveraging strategies, share information and best practices, mobilize opinion through public relations, social media and political activism, and identify legal strategies. The NLRB, the Department of Labor and the law will no longer offer dependable support and protection, so we must build our power with an engaged and informed membership and community and political allies. Contract campaigns must be prepared in advance and include building alliances with community organizations, political allies and human rights groups that will support us in our fights as we support theirs. Member contact and engagement is at the heart of all we do and central to our success. That is why a critical goal of CWA STRONG is to keep member communication and engagement at the center of everything we do. We must strengthen and rebuild our worksite mobilization structures and make sure we have the appropriate number of trained stewards in all work locations. Internal organizing is the most critical part of our CWA STRONG Campaign. CWA has been engaged in internal organizing for years, but the CWA STRONG campaign brings a new urgency, big goals and a coordinated, systematic union wide approach. It’s an “all hands on deck situation” requiring the absolute commitment and effort of all locals and staff. A 14 member team of staff is leading this expanded internal organizing effort. This group has developed a strategic internal organizing plan and structure to reach non-members in every district and sector. We will coordinate trainings, stewards communications, and large organizing “blitzes” across local, district and sector lines. Initially, we are focused on 26,000 non-members in telecommunications and another 26,000 public workers. As CWA STRONG expands, we expect to sign up tens of thousands of non-members and agency fee payers, and make internal organizing an ongoing and routine part of our work at every level. We will need the commitment of staff and locals to make this a success. As mentioned many times already, CWA’s strength is rooted in our ability to reach and engage members. To do our work successfully, we need to be able to identify and contact every member, non-member and retiree in any given workplace, zip code or occupation. CWA is in the midst of a multi-year project to develop a new online membership database, which will provide the critical tools and data needed for CWA STRONG contract mobilization, internal organizing and political and legislative action. Also in the works is the development of a new system that will allow us to efficiently collect dues and political contributions in workplaces where we do not have paycheck deduction or where it has been taken away through legislation. A common database system that holds over 700,000 searchable, sortable records will be a critical component of our CWA STRONG plan. CWA’s Human Rights program is uniquely positioned to further the overall goals of the CWA STRONG plan. Through new and ongoing campaigns, the Human Rights program is building internal infrastructure and educating members on key human rights issues that affect bargaining and organizing while simultaneously building a movement within CWA. The first step is building the Human Rights Department’s internal infrastructure by utilizing the National Civil Rights and Equity and Women’s Committees on the local level to educate and encourage active participation in CWA’s civic engagement campaigns. Committee members will encourage locals to partner with community organizations to further these campaigns, and enact change in their communities in line with CWA’s overall goals. We will provide information and training on important human rights issues and bridge the knowledge gap between human rights and bargaining, so that all members fully comprehend how human rights affect their livelihood. Lastly, we will mobilize in a meaningful way to enact change on both the local and national level. In January 2017 the CWA Human Rights program facilitated the participation of over 800 activists in the Women’s March on Washington. CWA created the space for members to bring co-workers, friends and family to participate in activism through their union. By fostering opportunities for members as well as nonmembers to engage around issues they care about, we demonstrate the value of the union. We face potentially devastating rollbacks of labor rights, extending the attacks that have been implemented by governors in State Houses across the country to the national level. We must have a vigorous program of membership education and engagement on these issues. CWA STRONG will continue to focus on fighting bad legislation, such as national right-to-work and privatizing Medicare that would weaken the union and harm our membership, and advancing legislation like the United States Call Center Worker and Consumer Protection Act and our Take on Wall Street Agenda, that will protect our members, their jobs and livelihood and develop relationships with legislators. Our focus will be fighting on issues that demonstrate to our members that we are fighting for them and their jobs. CWA’s legislative action on issues important to our members is a way to demonstrate to them the value of the union and a reason to join the union. We have made great strides in recent years in developing a core of rank and file activist leaders who both understand the big political picture—who is on our side and who our enemies are, and why it is critical to build a broad social movement—and who have the skills needed to fight back. We need to build on this foundation. The CWA national political program will work to expand the leadership development of activists in target states, build local political committees and develop lead organizers that can identify, train and develop other members into activists. Most importantly we will invest heavily in training the rank and file with the goal of increasing their understanding of the historical moment in which we live and motivating more of them to join this work and the union. To accomplish these goals we will develop statewide plans that integrate the priorities of CWA STRONG; and expand the Boot Camp and Intensive Training programs that will enable us to develop more high performing local union political leaders. In addition, the union must develop an approach to working with the many different organizations and movements that are resisting an anti-worker and pro big business agenda-the Working Families Party, Our Revolution, our various community allies, groups of local elected officials like Local Progress, the National Progressive Congressional Caucus and others. We remain deeply committed to building the broadest and most powerful progressive social movement. While this is a time of great crisis, the resistance which has taken shape since the election has been inspiring, and the largest popular mobilization the nation has seen since the Black Freedom and Anti-War movements of the 1960’s. These movements hold the seeds for a possible revival of progressive pro-worker politics in years to come, and CWA must play a role in relating to and nurturing these movements. The digital and traditional communications program will focus on amplifying the goals of CWA STRONG through increased visibility and member engagement. We start from a strong base with over 50 percent of our members receiving CWA’s weekly online newsletter, 50,000 liking our Facebook page, 35,000 following us on Twitter and over 50,000 visiting our website each month. We will use advanced data matching techniques and targeted advertising to increase the size of our email list, boost our social media following and bring more traffic to our website. Working closely with the internal organizing program we will use targeted social media and advertising to reinforce the messages being used to encourage workers to join CWA and to identify workers who are ready to join. This will increase the efficiency of our organizing efforts, allowing organizers to focus their efforts on workers who need additional information and education in order to join. Our social media efforts will bring visibility to our legislative and political fights and demands within CWA and in the broader progressive community. We will deliver thousands of emails, petition signatures and make phone calls to targeted elected officials and employers. In our public communications, we will continue to look for opportunities in large and small markets to highlight our members’ stories and struggles to have a voice on the job or obtain a just contract. We will expand on the media presence developed in recent successful campaigns and pivot to all aspects of CWA STRONG including our contract negotiations, and legislative and political initiatives. We will use the unprecedented scope and commitment to CWA STRONG to distinguish CWA as a strategic mobilized union with a robust agenda and fire power. Our legal work will be fully integrated like never before into CWA STRONG. The Legal Department will provide direct legal support to internal organizing efforts by Collection and review of sample union membership and dues authorization cards from public sector locals in order to be ready for any language or other adjustments that may be required by future court decisions. Production of tools for internal organizers including a “Know Your Rights” resource. This resource will focus on: when and where we can talk union, solicit or distribute at work, wearing of union t-shirts, buttons or stickers etc. Development of model contract language to facilitate union access to the workforce—for both members and non-members, as well as to facilitate solidarity actions by the bargaining units. Publicize CWA legal victories (in order to help internal organizers demonstrate value of membership) and significant decisions (in order to educate members about the stakes involved in the legal assaults on unions). This is an all hands on deck moment with no room for bystanders. CWA’s long standing commitment to member engagement and mobilization provides a solid foundation. Together we will be CWA STRONG. A New CWA Steward Training is in the Works! AT&T and Cricket Wireless members from Locals 7708, 7750 and 7777, gathered in Denver, Colo., last week for the pilot of a new CWA STRONG Steward Training program. At the CWA District 9 Leadership Conference, CWA President Chris Shelton rallied CWAers to channel the energy from the 2018 Midterm Elections into passing pro-worker legislation and more. Local 9510 is CWA STRONG! Members of CWA Local 9510 in Orange, Calif., are working to organize and mobilize at AT&T Mobility, and their hard work is paying off!